All content ©John Mayer 2000-2006 All Rights Reserved. Mounted on plywood in driver-side storage compartment. This article describes the wiring center I added to Casper, my Volvo 610 tractor. Most of this is generally applicable to any truck - the Volvo-specific parts are obvious. The purpose of the wiring center is to supply 12 /120-volt power for the cab, and to the trailer plug for the 5th wheel. This article covers the basic how to's along with resources for parts and accessories. The wiring practices described here are commonly used and are code conforming to the best of my knowledge, but this document should not be taken as electrical advice - it is simply the way I did it. My wiring center is in the driver's side compartment, on the forward (left) wall. It is built on top of ¾ plywood, which was glued to the plastic walls of the compartment with construction adhesive. Use of the plywood simplifies installation of components and permits use of cheap, commonly available fasteners without penetration of the compartment walls. I painted the wood black before installation - this provides a more pleasing appearance. To protect the terminals and wires from shorts and damage, two plexiglass panels cover the appropriate areas of the walls. This prevents cargo in the storage box from impacting the wire center. The plexiglass is mounted with ¼ x 3.5 lag bolts through ½ plastic pipe used as standoffs. The area over the inverter is not covered to ensure proper heat dissipation. The wire center is shown in the picture above without the plexiglass panels in place. The perspective is looking forward from the rear of the truck. All wiring is fed into the compartment from a 3" x 1" hole in the floor. The easiest way to do this is with a 1" drill bit - drill a hole at each end of the cutout, and use a Dermel tool with a cutting blade to connect the holes. The hole is a little crowded - you may want to consider a slightly larger hole. The trailer light converter provides power and signals to the 5th wheel. You need the converter because a semi-trailer has separate brake/turn signals and the RV trailer has combination brake/turns. The trailer connector lines you will tap in the tractor have to have the signals modified - the converter is what does this. Using a converter properly combines the signals, isolates the tractor from the trailer electricals, and is self-powered so you can not overload the tractor circuits when you add more lights to the trailer. You can wire the trailer directly off the tractor tail lights, but this is a bad idea. It will increase the chances of future problems. I used a Hoppy Model 46255 converter to supply the appropriate signals. This is a powered converter - the advantage is that it isolates the truck electrical system from the trailer, preventing any shorts in the trailer from impacting the truck. If you have a lot of lights on your trailer (or expect to add them) you might want to use the Hoppy 46365. This converter can handle 8 amps. The converter is the gray box directly below the inverter. Look in the Resource Listing section for sources for the Hoppy. The inputs to the converter come from the existing green Volvo trailer feed wire, which was originally terminated behind the cab. This was disconnected and moved into the storage box, through the hole in the floor. Turn signals and brake light feed were picked up from the original trailer connector. The brake light signal was fed forward (with a 14-gauge wire) into the cab to act as the brake signal for the Prodigy brake controller. It was easier to pick the brake signal up here than to find the brake signal in the cluster of wires in the Volvo fuse center, and since you have to run a wire back from the controller anyway, it was no additional work. The braking output from the Prodigy is returned on a 10-gauge wire to the wire center, where it is soldered to the new trailer connector line, which then runs to the rear of the truck. This brake line feeds 12v power to the trailer braking system and needs to be at least 10 gauge to minimize voltage drop. Any connection in this line needs to be soldered, or you will loose too much voltage. 78001 Controller, price 295.00. The phone number is 1-877-338-7373. The drawing on the left shows an overview of the converter wiring. A detail drawing of the wire breakout (courtesy of Doug Simpson), can be seen at Electrical Photos. An even better drawing is on the web site of Mark Bruss: http://www.dmbruss.com/RR_EW_TrailerWiring.htm. It shows the logical connections between the existing Volvo trailer cable, and the new trailer cable being added. I mounted all of my connections in the storage box. Mark, Doug and I all used barrier strips to attach the wiring. This has several advantages: 1) it allows you to move the wires around, if you get them wrong the first time 2). it makes for a neater installation 3) it allows you to add auxilliary lighting (like LED stop/turns) on the rear of the truck cab and keep it isolated from the tractor system. Make sure you rub some oxguard onto the wires before crimping on the terminals. All of my wires run from the storage box, down through the floor, and then forward under the cab. They are strapped to the existing wire bundle that is attached to the frame. They re-enter the cab just forward of the drivers seat, just inward of the removable floor trim plate through several small holes drilled in the cab floor. They proceed forward to the front of the truck under the floor mat, and from there either up to the top of the dash, or through the dash, as appropriate to their function. Some wires run along the top of the dash down by the defroster outlets in black split loom. You don't see them in that position. These wires are the camera wires for my backup cameras, and the telephone cable that controls the remote On/Off for the inverter. The brake signal (input) and return (output) wire from the Prodigy controller are run inside the dash to the controller which sits just to the right of the drivers right knee. You could also run the wires forward into the engine compartment and bring them through the firewall through a grommet. I found it easier to bring them in at the door jamb. The 120 volt AC line that feeds the receptacle on the dash runs on the opposite side of the truck routed under the mat in a similar fashion, except that it comes through the rear of the storage compartment, behind the refrigerator (which sits behind the passenger seat), and then under the floor mat. I ran the 120-volt power on the opposite side of the truck so that its proximity to the camera line would not cause interference. 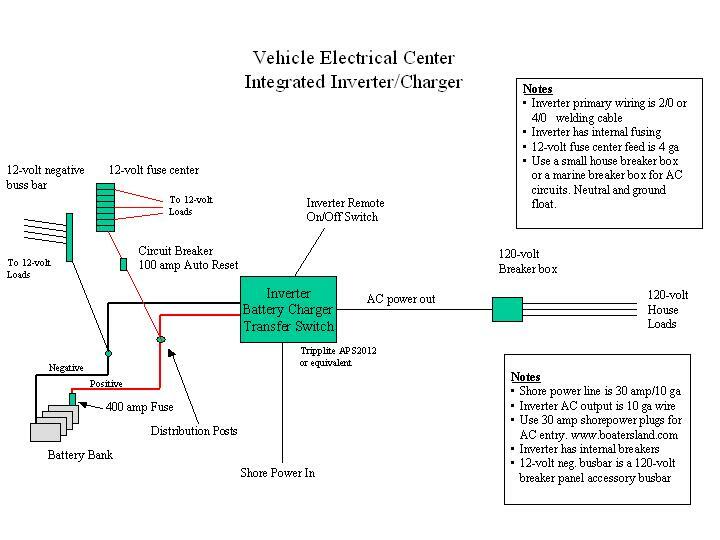 The wire center is supplied with 12-volt power directly by the inverter cables. The inverter cables terminate in distribution hubs at the wire center, which allows you to easily tap power for various functions. All negative wires terminate directly onto the negative distribution hub. There are no terminations to the chassis - this will prevent bad grounds in the future. Just to the left of the inverter is a small 12-volt fuse center. I aquired it from Wrangler, but you can find similar fuse centers at good auto parts stores. Blue Sea makes a very nice fuse center with either a 6 or 12 circuit capacity. This has a negative bus incorporated into it. The part number for the 12-position is 5026 (http://www.bluesea.com/product.asp?Product_Id=30990). My fuse center currently contains the Hoppy converter fuse, a fuse supplying a relay for my bed-mounted backup lights, and a fuse for the 12-volt supply for the cameras. The backup lights are tapped from the tractor cargo light switch, so when I activate the light on the back of the cab, the lights built into the back bumper also come on. You can add a negative 12-volt buss bar if you need one. Use a buss bar from an AC load center. These are available in the electrical section of Home Depot or Lowes, and are used to add neutral and ground busses to load centers. Just screw it to the plywood and you are ready for hookups. Use a neutral lug and 4 or 6 ga cable to tie it to the distribution hub. You could buy a negative buss bar from a specialty catalog - these have the advantage of having a post to tie in the negative feed line. They also cost upward of $99, depending on what you get. Future expansion of the system is much easier with the fuse center in place (I have learned this the hard way). In the cab, the Prodigy controller is supplied with 12-volt power from the distribution hub on the firewall, directly above the steering adjustment pedal. Ground for the Prodigy is tapped directly off the battery, following the instructions for installing the Prodigy. Alternatively, you could tap the negative post behind the steering adjustment pedal, but the Prodigy instructions are specific about tapping the battery directly. Both the ground and the positive are 10 gauge wire - overkill, but I had it. The new trailer wire harness is supplied with 12-volt power from the distribution hub in the storage compartment. Typically, you would tap the output of the alternator to supply the trailer line. You would use a battery isolator or a solenoid to separate the banks - really only required if you keep the trailer and truck plugged together for long periods. If you really want to get fancy you could use a "smart" charging switch, or a cross-charge regulator in place of an isolator or solenoid. This would ensure that both the truck and trailer battery banks get a full charge off the alternator. If you don't use a "smart" charging switch then the alternator will shut down when the first battery bank reaches the cut-off voltage of your truck regulator. This will leave the other bank (typically the trailer bank) without a full charge. NEVER use a battery A/B/Both switch. These just cause problems and if not used correctly can cause a system-wide electrical surge (if you switch it wrong while the alternator is running) that will burn out your alternator diodes and/or other truck electical components. In my application these are all unnecessary. Since I have a large solar system (480 watts, 29 amps), I find that satisfactory for my trailer battery bank charge. I only want access to 12-volt power at my trailer plug in order to run 12-volt appliances (like a 12-volt water pump for pumping water from the truck to my trailer when boondocking). You will probably want to tap your alternator output if you depend on the tractor to charge your trailer battery bank. Using the tractor battery bank as the charge source for the trailer bank will result in the trailer bank never being fully charged. 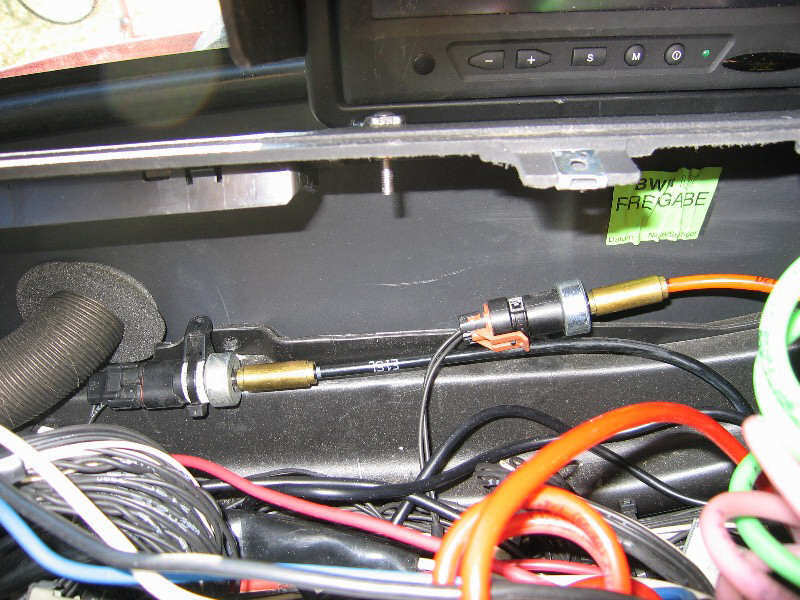 On the dash behind the CB radio holder I added a three outlet 12-volt accessory receptacle. This is handy for the GPS, etc. This is permanently tapped off of the CB power point, from behind. You have a choice to make when you design your 120-volt system. First, you can build a minimum system that meets your electrical needs. Most people only run a refrigerator, occasionally use a microwave, and TV/satellite/DVD. The electrical requirement to support these devices is minimal, especially if you use an LCD TV. So you really don't need an expensive or fancy system. Figure out your electrical requirements by checking your devices for their power requirements; add up the wattage of all your devices that will run at the same time. Add at least 40% to that and you know what size inverter you need. Typically, that would be 1200-1500 watts, or less. The second system is more sophisticated and permits more future expansion. It includes a larger inverter that incorporates a charger and autoswitch. This permits you to expand the system to include a separate house battery bank, and to run higher-powered devices for longer periods of time. This system approaches the capabilities of an RV system typically used with a solar setup. The advantage of using the inverter/charger is that the autoswitch capability makes your 120-volt wiring much simpler. It also costs significantly more! The inverter I used is a Xantrex XPower 1200 (1000 watts, continuous) with the optional remote control. I purchased this online, through www.buy.com . At the time, they had the best price (around $170 for both). I chose the 1200 because the highest power appliance I intend to power is a 600-watt microwave, and this inverter has adequate power to do it. There is also an XPower 1750 (1500 watts, continuous) available; it uses the same remote control. If you want an integrated inverter/charger/transfer switch then the Tripplite APS2012 would be a good choice. They run around $600 online; you will also want the $105 remote switch. The integrated inverter/charger/autoswitch costs more, but makes the wiring a little simpler. Ideally, any inverter you choose should be direct wire (for both AC and DC) and should have a remote on/off switch. Direct wire for the AC output circuit simplifies the wiring to your house loads. If your inverter has outlets, most likely all of the rated output is available from any of the outlets. Just use a 12 ga extension cord (cut to the appropriate length, or a direct-wire plug) to supply the 120-volt power to either your 120-volt junction box, or loadcenter. The remote on my inverter (and most of them) uses a 4-wire telephone cable. It attaches to the back of the inverter. The control panel on mine happens to be the same height and brushed aluminum finish as the Eaton autoshift display, so I removed a screw from the Eaton panel and mounted the remote right on it. If you don't know differently, it almost seems like it belongs there. [A note on inverter technology. All the inverters above are modified sine wave. You may hear that using anything but a pure sine wave inverter will cause interference problems with TV's or that certain devices won't run at all. While this is certainly possible, depending on the device, modern modified sine wave inverters run almost all devices "cleanly". I would not hesitate to use a modified sine wave inverter for everything except very specialized applications. Some TV's will not work with modified sine wave - but I have never seen one, and I have installed many inverters in both RV's and vehicles. Oxygen concentration equipment, laser printers and certain battery chargers all need pure sine wave. Almost all other devices work fine on modified sine wave. My inverter is mounted upside down for access to the lugs. To the right of the inverter is a 30 amp DPDT relay with a 120-volt coil. Any good electric supply house should have them. The relay takes as input the 120-volt inverter output and the shore power line. The shore power also feeds the coil, so when shore power is available it will always be favored. A cover is available for the relay, and I recommend spending the extra $20 to get it. I covered the entire area with a plexiglass panel so the power lugs are protected, but the relay cover would probably be better. The relay cost $27 without the cover. An alternative to "building your own" transfer switch from a relay is to simply buy a transfer switch. Iota makes a good one at a reasonable price. A 30 amp version is $55 at http://www.solarseller.com. If you are going to buy the cover for the DPDT relay like I used, just buy the transfer switch instead; you will be better off. Of course, if you are using the higher-priced inverter/charger with an autoswitch capability you will not need to set up your own transfer switch - it is built into the inverter. The shore power connector is shown to the left. In my case, Larry used a 20 amp block heater connector when my truck was converted, which was adequate for my loads (I plug into 20 amp power sources, either on the side of my RV, or the receptacles in the RV power post). If you supply a 30 amp shore power input, use the appropriately rated shore power connector. A twist-lock marine connector would be a good choice - see http://www.boatersland.com for a good selection of parts. 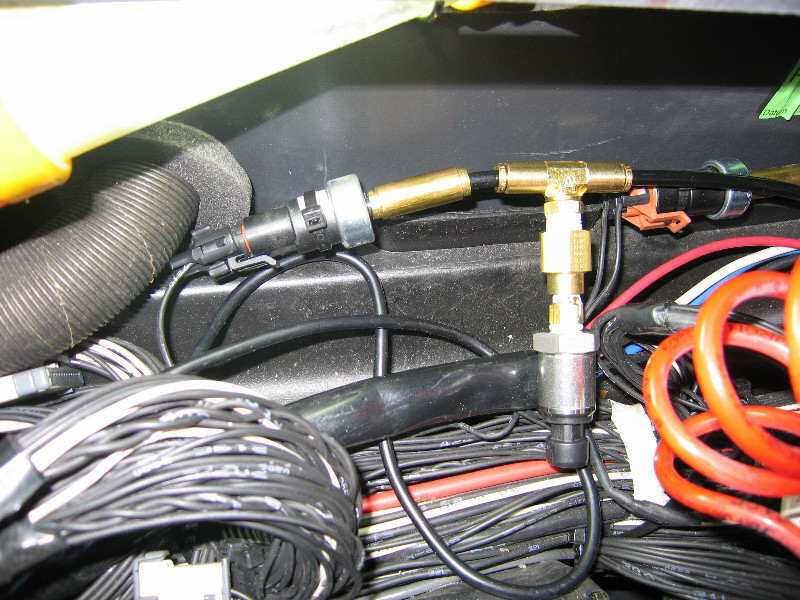 Even if you use a 20 amp connector like on my truck, the wire from the shore connector to the 30 amp relay should be 10 gauge, in order to support a full 30 amps. If you wire it this way from the outset, you won't have to upgrade this later if you decide to increase your power input and switch to a 30 amp connector. If you store your truck for long periods of time and want to keep your batteries charged via your shore power hookup the simplest way to do it is to use a 120-volt trickle charger. Wire the feed for this onto the relay where the shore power line attaches. Make sure you maintain polarity if the charger requires it. Wiring to the input side of the relay will ensure that the charger only draws its power from the shore power hookup, never from the inverter. An alternative (and maybe better) wiring strategy is to put a receptacle into the shore power line inside the compartment, but before it goes to the relay. Then, simply plug the trickle charger into the receptacle. The output from the trickle charger ties directly to the distribution posts - cut the battery clamps off, and replace them with ring terminals. You want to make sure you tap into power before it enters the inverter - you don't want to try to charge batteries with the inverter output from the batteries. Again, this is not required if you use the inverter/charger, because the charger is built into the inverter. In my installation the output from the transfer relay goes to a 4 inch electrical junction box where it is split into 2 lines. The first goes to feed the refrigerator and microwave. It is routed through the back of the storage compartment, wire wrapped to the existing wire bundle. Instead of mounting a receptacle in/on the passenger-side storage compartment, I used a direct-wire multistrip, which I mounted above the blower inside the passenger-side storage compartment. The plugs for the refrigerator and microwave enter this compartment through a hole behind the refrigerator. This was easier and just as effective as a wall-mounted receptacle. I specifically did not want a receptacle because I wanted the refrigerator to be flush against the side of the storage compartment - with a receptacle the plug would have interfered with flush mounting. I also did not want to see any cords in the cab area. Instead of using a junction box to originate your 120-volt wire runs, you can alternatively put in a 120-volt loadcenter. If you use the higher-powered inverter/charger, or have a 30-amp shore power input this will be required, because you will not have adequate overload protection on your truck circuits without it. (If you restrict yourself to a 20 amp input you have properly sized breakers at the power source. With 30 amp input your truck wires could become overloaded, since the source breaker is 30 amps and your internal wire runs are probably wired with 12 or 14ga.) Size the loadcenter to support the number of circuits required for your application. Like the junction box, the input to the breaker box (loadcenter) is the output from the transfer relay (either the separate relay, as in my installation, or the relay inside the autoswitching inverter/charger which just passes through shore power when it is detected). 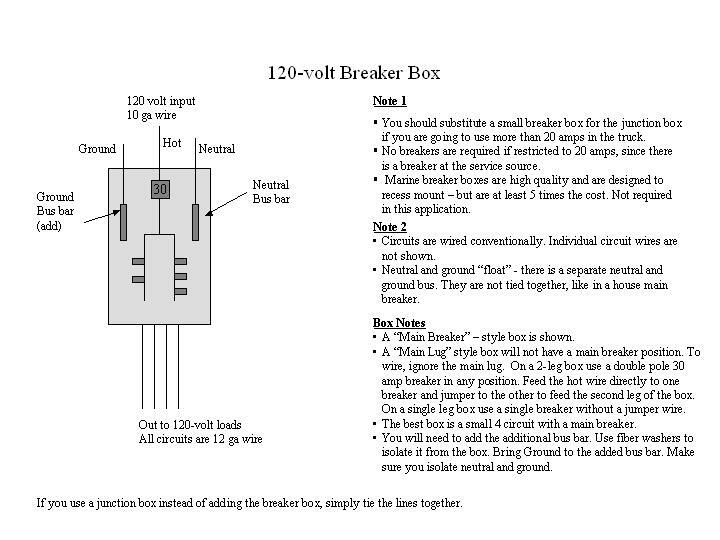 A schematic of the breaker box is shown above. The second 120-volt line follows the first one through the storage compartment, through the hole, behind the refrigerator, under the floor mat, and up onto the truck dash. 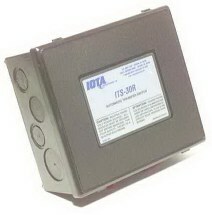 There it terminates in a standard shallow duplex box (painted black). I use this for my laptop computer (no, I do not have a 12-volt adaptor for it). Ground the inverter following the manufacturer's instructions. If you are using an inverter with a transfer switch, the AC ground input and output lines have lugs or ground wires inside the inverter to attach to. If you are using a small inverter and its inbuilt receptical then the AC output line ground is simply part of the wire you plug in. Internal to the inverter, it is likely bonded to the chassis. Almost all larger inverters have a separate external chassis ground lug on them. This goes directly to chassis ground - NOT to the DC negative bussbar, or the battery ground, or the AC loadcenter. Usually, 8 AWG wire is sufficient, but the inverter manufacturer will specify the wire size depending on the inverter size. The AC output from the inverter goes to some sort of AC distribution panel (or junction box, if not protected by breakers). In the case of smaller inverters without an inbuilt transfer switch you will run it through an external transfer switch or relay to control shore power selection. If you are using an external transfer relay like the Iota, follow their instructions on grounding hookup. There will either be bonding terninals inside the transfer switch, or they will specify the method that the grounds be bonded to each other. If you are using a DPDT relay, like I did, then bond all the grounds together and crimp them. If you use a wire nut, make sure you tape it. You can see this in the picture of the DPDT relay (follow the green wires). Establish a chassis ground either where you merge the grounds (add an extra chassis ground wire to the three existing ground wires) , or at the AC distribution panel or box, depending on how you prefer to wire. When not connected to AC shore power the chassis ground will offer some protection, but it is nowhere near as good as an earth ground. When on shore power, ground will flow back to the utility ground. If your electrical needs are great (or if you think they are) you have no alternative but to add a separate house battery bank to your vehicle. We are talking about electrical usage while not connected to any charging source – e.g. the engine is not running, and you are not hooked to shore power. The starting battery bank will suffice for occasional boondock use, but is not designed to be deeply cycled. If you deep-cycle your starting bank more than a couple of times, you will be buying batteries. Adding a separate house bank solves the problem of overburdening your starting bank, but creates its own set of issues – mainly cost and complexity. A lot of cost, and a lot of complexity. In order to have a properly functioning house bank you need to have a charging source for it. Deep cycle batteries are more sophisticated than starting batteries and require a multi-stage charger in order not to “kill” them over time. Using just your alternator with its stock regulator will result in a constant undercharge – remember, that alternator/regulator is designed to maintain starting batteries, which are rarely discharged more than 5%, and have a different charge curve than deep cycle batteries. Fortunately, if you are implementing a house bank you are probably already using an inverter/charger which is designed to manage deep cycle batteries. So you will have a way of fully charging your house bank when hooked to shore power. I always build my own cables. First, it is cheaper and you get a better product. Second, it is difficult or impossible to get the wire lengths and orientation of the lugs correct if they are built commercially. It is not difficult to build your own high-amperage cables, but you do need the correct tools and parts. For tools, you need a cable cutter that is capable of cutting at least 2/0 cable. Klein makes a compact cable cutter that will work - available at electric supply houses and Home Depot/Lowes for about $25. This will cut 4/0 with a little grunting. Believe me it is worth buying. If you decide not to use a cable cutter you can cut the wire with a reciprocating saw or hacksaw - clamp it in a vice first. If you go this route you will have ragged ends - use a grinder to smooth the edges out. If you don't you will never get them into the lug - the lugs are pretty much the EXACT size of the wire. You also need a large crimper for the magna-lugs you will use. At the end of this section is an example of a hammer crimper that works well. You put the lug into the anvil and whack it with a maul. The alternative to crimping is to solder the lugs. If you decide to solder I recommend Fusion lugs. These have solder and flux in the barrel of the lug. You stick the lug in a vice, heat it with a torch and when the solder melts insert the wire. The problem with this is that it is often difficult to get the wire in, and you have to fool with it. Difficult when you have a hot lug and limited time to get the wire in. I prefer to crimp. Note that these lugs have closed fronts, and are tin-coated for corrosion resistance. They are pure copper underneath. The lugs, crimper and battery extension posts (see below) are available at www.solarseller.com, http://www.thesolar.biz, or at www.wranglernw.com. You will find it useful to call Wrangler Power (800-962-2616) and order their catalog. They have high quality parts, regulators, high output alternators, isolators, lugs, 12-volt fuse centers, etc. described in the catalog. Their website is very difficult to use. Solarseller has better prices than Wrangler, if they have the part. If you can't find wire locally you can get it from http://www.weldingsupply.com. They have colored wire for a reasonable price. You also need an antioxident, which is used on the wires before crimping. This helps prevent corrosion and decreases electrical resistance. Apply to the wires and rub in. Squirt a little into the lug before crimping. You should put antioxident on all wires - no matter the size - before crimping. One brand name available at Home Depot/Lowes is Oxguard. After crimping you apply an adhesive heat shrink tube (color coded, of course) over the lug. Once melted, the adhesive totally seals the barrel of the lug and greatly minimizes future corrosion. You will probably have to mail order the adhesive heat shrink tubing (either source, above). You should always use welding cable for high amperage cables, which is easily obtained at any welding supply house. Buy it uncut and cut it yourself when building the cables. I bought 16 feet of 2/0 for my Volvo (for $28 including tax), and had several feet left. I never use less than 2/0, at least for 1000 watts or more. On solar installations I generally interconnect the battery bank with 2/0, and run 4/0 to the inverter, depending on the size of the inverter and the length of run. Of course, on the Volvo, the battery bank is already interconnected. Unless you are using a very large inverter, say over 2000 watts, and intend to pull large loads it is not necessary to rewire the Volvo battery bank. Just use the appropriate size cable to feed the inverter. Hooking up the inverter cables is not difficult but there is only one correct way to do it. The positive feed originates from one side of the battery bank, and the negative feed from the opposite end (battery 1 and battery 4, in my 4-battery system). My negative feed comes off the left most battery, but you can do the opposite if you want. Diagonally loading the bank ensures that all batteries are drawn down equally. If you hook both leads to one battery - no matter which one - that battery will be supplying more of the load than the others. Rub a little oxguard on the lug before bolting it down. You may have to drill the lug to a larger size, depending on the lug and the battery. You might want to measure the battery terminal bolt size before ordering lugs. On the positive battery terminal feeding the inverter you need to insert a fuse of an appropriate size - 25% larger amperage than your largest load (or possible load) but also within the ampacity of the cable (this should not be a problem if you use 2/0 cable). Your inverter installation instructions should tell you the appropriate size. I use Buss type T-JJS DC rated fuses. This prevents accidental welding or other catastrophic shorts. To get the barrel of the fuse to clear the battery you need a battery extension post, otherwise there is not room. Just bolt the lug to the fuse, and the fuse goes directly on the extension. Don't forget the oxguard. You can wrap the fuse with good quality electric tape to minimize the chance of a short when using tools in the battery compartment. You can also mount the fuse in a fuseholder. On vehicles this is often difficult to do and still keep the fuse within a (max) of 18" from the battery. So I generally mount the fuse directly to the battery post on vehicles. On RV's I almost always use a fuseholder, since there is usually plenty of mounting room. Either approach is acceptable. On my Volvo I ran the cables together (directly next to each other - you can tie-wrap them together if you want) and then tie-wrapped them to the existing cable run along the frame, bringing them up through the floor of the storage compartment to the distribution hubs. You can twist them together if you want, but it does increase the length and I doubt you will notice any difference. Both methods increase electrical efficiency and cut down on magnetic interference. I have installed over a dozen inverters this way, and have never experienced any interference with other electronic devices. When you go to build the cables, build them one at a time - do not try to cut them all to length and then mass-produce the ends. You need to take into account twists and turns in the line - the lugs do not necessarily orient in the same direction. I have found that if you put one lug on and then take the entire cable bundle and lay the uncut cable out in its final position (or approximate it), then place the uncrimped lug on its bolt and actually lay the cable across the lug you will get the exact length you need. Make sure to place an orientation mark on the uncrimped end so you know the angle of the lug on the wire. Otherwise you may find you have a very twisted wire because the lug is rotated into an inconvenient position. Repeat for each cable. Typically, you do not leave extra length in inverter-feed cables. Every foot counts against you for voltage drop, so make the cable runs as short as possible. Example of a mega lug. Use a mallet to create crimp. Cable cutters for up to 4/0 cable. These will save you alot of time.